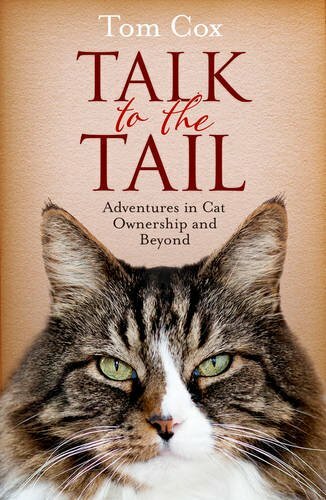 Talk To The Tail by Tom Cox is an absolute gem of a book for any cat lover. This was my second cat book by Tom Cox and I enjoyed it just as much as the first. Tom Cox has the gift of capturing exactly what life is like with six cats. As the owner of five (it used to be six) cats myself, I find myself in agreement with Tom on so many things in his book. Like Tom, I can recognise the difference meanings of miaow’s. Our late cat Ben’s “look what I have caught” miaow is very different to Marble’s “help I’m going to be sick” miaow. Tom has certainly captured the essence of life with cats. As every cat person knows, no two cats are the same. It was an absolute pleasure to read about the different personalities of Janet, Pablo, The Bear, Shipley, Ralph and Bootsy. One of my favourite descriptions was that of Shipley, “I live entirely in the moment and think exclusively about my own needs on a minute-by-minute basis”. Love it! What a classic. Owning cats unites cat lovers. It does not matter how old you are. Tom writes of a wonderful bond he had with his octogenarian neighbour and her cat. I love Tom Cox’s style of writing. He writes what he observes but brings humour in the telling. There were moments when I laughed out loud. There were also moments when I shed a tear. Tom Cox has perfectly captured life with a multi cat household. 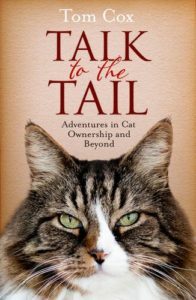 Talk To The Tail is an absolute ‘must read’ for any cat lover. I certainly cannot get enough of Tom’s books and shall definitely be tracking down more of his books. I am just glad he’s written loads! !